In 2006 Americans spent somewhere in the neighborhood of $1.6 billion on short-term missions. Some 2.2 million Americans were involved in one of these trips, up from just 120,000 two decades before. Such misson work has very nearly become a rite of passage for young American Christians. Many years ago I spoke to a missionary who was often asked if teams could come and visit his work in South America so they could help build a home or rebuild a church. He told me then that such trips often do more harm than good; that he actually dreads having yet another team show up, trying to help. I did not have time to ask him much more that day, but his words have long shaped my view of short-term missions. But now, having read Steve Corbett’s and Brian Fikkert’s When Helping Hurts I understand more. Too often our well-intentioned efforts to help actually hinder the work of alleviating poverty. 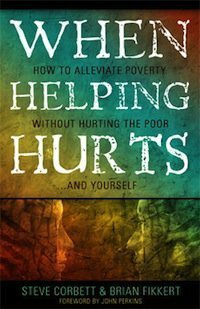 The title and subtitle of this book are deliberately provocative: When Helping Hurts: How to Alleviate Poverty Without Hurting the Poor and Yourself. It is difficult for us to imagine how our efforts to help can actually harm both ourselves and the people to whom we extend a hand. And yet those who work with the poor can testify to a great deal of harm done to both. Standing in the position of the wealthy, we often feel like we know all the answers; that if the poor were just a bit more like us, they would be much better off. But “one of the biggest problems in many poverty-alleviation efforts,” say the authors, “is that their design and implementation exacerbates the poverty of being of the economically rich–their god-complexes–and the poverty of being of the economically poor–their feelings of inferiority and shame.” Or else we are too quick to act without understanding the nature of the poverty before us, without understanding whether people need relief, rehabilitation or development. According to the authors, “One of the biggest mistakes that North American churches make–by far–is in applying relief to situations in which rehabilitation or development is the appropriate intervention.” There are times when giving money is the right thing to do and usually that is the easy thing to do. But far more often, we need to give time, attention and discipleship. This book offers a much-needed dose of humility to missions, both long-term and short-term. America has the proud distinction of being the nation that gives more than any other for the alleviation of poverty. And yet Americans may have a sense of superiority, a kind of confidence, that causes them to do more harm than good, or as much harm as good, in many contexts. The authors warn their fellow Americans against the tendency to assume they’ve got all the answers and to assume that a quick fix is a good fix. The challenges facing those who are impoverished are nearly always far more than a few dollars, or a few thousand dollars, can easily fix. This book, with its holistic view of poverty and its eye on Jesus’ power to renew and restore what is broken, offers true hope. If you are going to go on a short-term missions project you need to read this book; if your church is getting involved in working with the poor in your community, you need to read this book; if your church is looking for involvement with missions work overseas, you need to read this book. Corbett and Fikkert tells what we’ve been doing wrong and offer solid, practical, biblical advice on what we can do to get it right at last.